This post is a review on a body talc from Oriflame. I have used lot many products from this brand but few from Giordani like its bronzing pearls. This time this talc was gifted to me by one of my close friends. Actually not gifted but it came complimentary with other Oriflame Products I ordered. I don't use body talcs frequently but mostly in summers specially prickly heat powder for acne. This time I bought this one from Giordani mainly because of its amazing raved fragrance. Though I was not very much impressed by its simple round packaging but the name was enough for me to but the product. Check out the review below to find what I liked about this Oriflame Giordani Gold Franced Body Talcum Powder. What Oriflame Giordani Gold Talcum Powder Claims? Silky body talc infused with the elegant scent of Giordani Gold. Absorbs moisture and leaves skin feeling smooth and refreshed with longer lasting scent. Price - Rs 99/- for 100g. 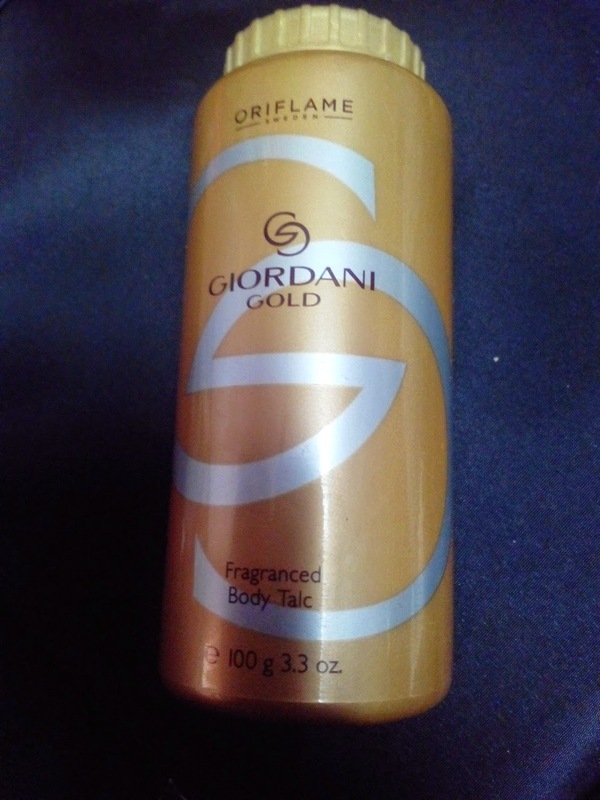 This Oriflame Giordani body talc comes in a simple round packaging which looks quite boring to look it because of its shape but the brand and the gold color of the bottle balances the boring shape somewhat if not fully. There is twist sprinkler at top like in most body talc bottles. This Giordani Gold Body Talc is truly gold because of its gold fragrance. Yes the fragrance of this talcum powder totally stands out from the fragrance used in regular body talc's. It definitely feels premium and not just like an ordinary talc. In fact one might even think this as of perfume or a deodorant fragrance if not told. So I am truly impressed by the this talc in terms of fragrance. Now let me tell you the best thing about this talc is that it takes away the oiliness and moisture from skin and thats why is one of the best body talc for summers. The body talc takes away the oiliness making fragrance last longer thus leaving skin fresh and smelling good for long. Along with smelling good, the skin also feels soft to touch after using this talc. This was all about this talcum powder. I truly liked it specially because of its oil absorption quality and would definitely buy it again in summer. Very nice fragrance body talc. Absorbs oiliness and leaves skin matt. Nice body talcum powder for summers. Only available with agents offline. Nice review. I've this product and I would say its a must have for on-the-go women during summers. Does a grand job of refreshing and oil absorption leaving smooth and refreshed skin with longer lasting scent. I use it 2 - 3 times a day to keep me looking fresh in hot summers.